Early data from a group of beta creators demonstrated that using the merch shelf led to a meaningful increase in visits to purchase pages as well as revenue from merchandise sales. We’re excited to work with YouTube to diversify your income through merch and make it more accessible to your viewers on YouTube. It’s only visible to viewers in France, Germany, United Kingdom, Ireland, Italy, the Netherlands, Belgium, Portugal, Spain, Canada, Australia and the United States (so you’ll still need to post the link in the description or use cards and end screens). The merch shelf will display up to 12 products, selected from your active Teespring listings. Your merchandise will be ordered based on sales, with the most popular designs being displayed first. However, we’ll prioritize designs launched in the previous 10 days over older designs. You can choose to select the first 4 products to be displayed under your videos at any given time using the ‘Integrations’ tab in your Teespring account. Sales referred from your merch shelf will qualify for an additional YouTube bonus of $1 per item sold. This bonus offer is valid through June 2019. Sales referred from your YouTube merch shelf will qualify for an additional YouTube bonus of $1 per item sold, paid at the end each month. Stickers do not count towards the bonus. Bonus is valid through June 2019. 2. Fast VIP support with premium.support@teespring.com. Our support team is available 8am-11:30pm EST M-F, 4pm – 8pm EST Saturday and Sunday. We will respond to any enquiry within 12 business hours. A one-time design consultation where you can upload up to three files for review by our design team within five business days. We’ll provide a free personal consultation and a design you and your fans will love if you have 500K+ subscribers and have uploaded a video in the past 60 days. You own the design and we’ll send you the original art files. If you think you qualify, please email premium.support@teespring.com and they’ll put you in touch with a Teespring Creator Manager. You can also check out this blog post about how to source designs and ideas. Navigate to your YouTube Studio Beta and click on “Monetization.” You’ll only see this option if your channel is eligible. Navigate to merchandise and click “see more”. Then click “Get Started” to proceed to connect accounts. From there, click “Get Teespring ID” which will open a new tab on Teespring. Just sign in with your Teespring account (or create a new one). Once you sign in (or sign up), we’ll display a nine-digit Teespring “Store ID” number. You need to copy/paste it into your YouTube Studio Beta to finalize the connection. “Teespring product editor” takes you to Teespring (check out our Creator Guide for best practices). Note that it can take up to 14 hours for your products to show up underneath your videos after completing the connection. Q: Where can I find my Teespring Store ID? 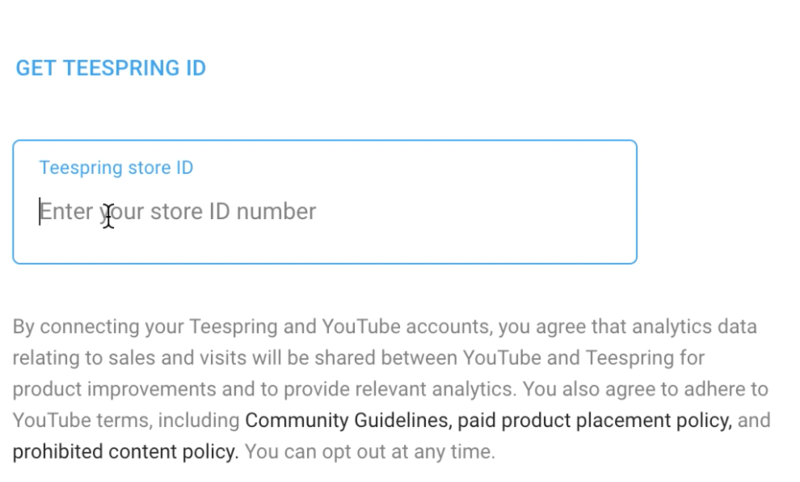 A: First, you must complete the onboarding process described above through your YouTube Studio Beta to sign into Teespring to create a Teespring Store ID. 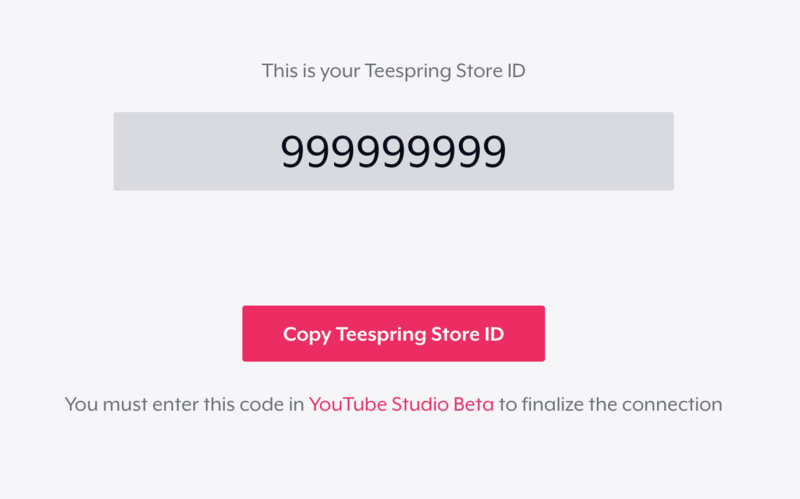 It is also important to copy and paste your Teespring Store ID into your YouTube Studio Beta to finalize the connection. Afterwards, you can reference your Store ID in three locations: 1. You will receive an email from Teespring containing your Store ID as soon as you sign in or sign up through the YouTube Studio Beta. 2. While signed into your Teespring account, visit teespring.com/youtube/gmc to bring up the original Store ID page. 3. In your Teespring account settings. Q: Will this affect my Google AdSense revenue? A: No, this is a free service provided by YouTube and Teespring and it does not detract from your AdSense revenue. A: Nope! This is a completely free program and it will not interfere with your ad revenue. 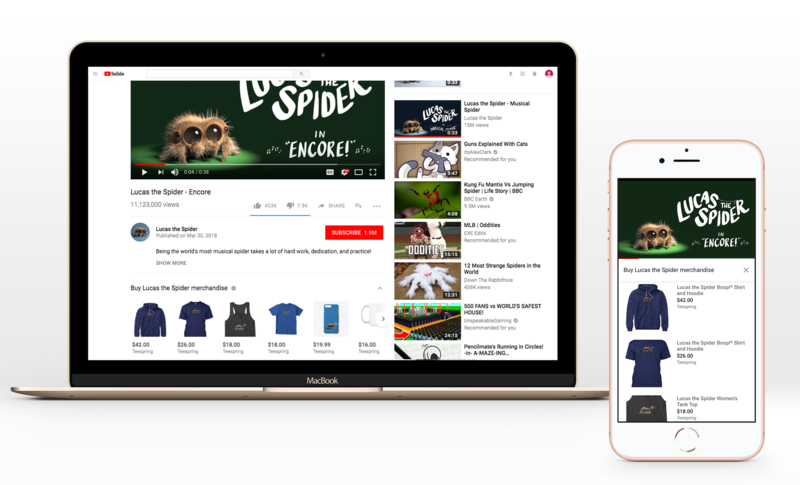 In fact, program participants are paid a monthly YouTube creator bonus – an additional $1 per every item you sell through the merch shelf. Q: So does this mean I no longer have to include links in my video descriptions or do in-video promotion? A: No, this program has only been rolled out to viewers in a few countries listed above, which means your global viewer may not see the feature. To make sure they get a chance to purchase your merch, we highly recommend that you keep doing all the great things you’ve been doing. Q: Why can’t I see the feature in my YouTube Studio Beta? A: The integration is currently available for select creators in the YouTube Partner Program and who have more than 10,000 subscribers. To qualify for eligibility, creators must have no Community Guidelines Strikes. Q: How many products are displayed on the shelf? 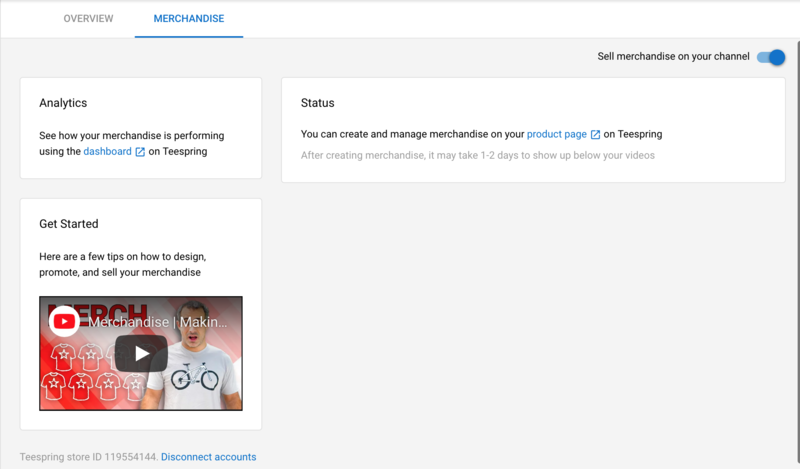 A: The YouTube merch shelf will display up to 12 products, selected from your active, non-private Teespring listings. If you have multiple colors, the featured color will be displayed. Q: Can I select the order in which my products are displayed in the shelf? A: Yes you can! You can select the order of products in the monetization tab of your YouTube Studio Beta. Otherwise, designs will be ordered based on sales, with the most popular designs being displayed first. However, we’ll prioritize designs launched in the previous 10 days over older designs. Q: Can I choose which videos under which to show my merch (for example, if I don’t want all of my videos to display a merch shelf)? A: No, you cannot exclude certain videos to exclude from the merch shelf. Q: Can I allow different sets of products to show up under different videos? A: No, the same merch will appear in the shelf under each video. Q: What kind of data does Teespring share with YouTube? A: We share data about your Teespring account, including number of purchases, number of page visits, retail price of items sold, total revenue and profit, cancelled orders, and whether the page visit came from the merch shelf. We do not share any personally identifiable information with YouTube. Why is my design available on Teespring but not visible on the YouTube merch shelf? A: Products featured in the merch shelf must comply with YouTube’s Community Guidelines. If your design is listed on Teespring but not on the merch shelf it may have been removed due to content concerns. If you recently uploaded the design to Teespring it can take up to 14hrs to show up on YouTube. If you need help with something or have other questions, please send us a note at premium.support@teespring.com or use YouTube’s “contact us” page. You can also check out YouTube’s help center article.